← Random Panel: A thousand words, two periods. Genius. If too much of a good thing is bad, then what is too much of a bad thing? Answer: This costume. He's got one rope lassoing his face, and the other about to ensnare his package. One can only assume this outfit was designed and stitched by his passive-aggressive wife, too afraid to outright tell him to keep both his mouth (and everything else) zipped, and so reduced to this subtle yet menacing textile rebuke. You'd think two obnoxious rope elements would be enough, but you don't get to the top of the second-rate super-villain ladder by taking half measures, my friends. No, you see those two ropes and you raise yet another one, this time actually tied to your waist. Undoubtedly it's there as an emergency backup lassoing device, which then raises the question of how menacing he'd be with his pants falling down. Or maybe those are sans-a-belt slacks; he's certainly clever enough to have thought that far ahead. Or at least, not if you consider the evidence of those armpit cutouts so everyone can enjoy his manly aroma and the super-baggy sleeves. Seriously, how does he even throw the rope with those sleeves? "I have you now Firesto -- crap! One sec, tangled on the sleeve ... there! OK, now -- CRAP!" I don't even want to know why he has metal boots and gloves. I've been to my share of rodeos, folks, and not once did I see a cowboy roping with metal gloves. I'm just sayin'. 15 Responses to Slipknot, not. IMO this costume wouldn’t be too bad if it werent for the ropes on his face and chest. And the cutouts on the chest. Those sleeves would not get in the way. When you bring your arm up to swing the lasso the sleeves are going to go down towards his elbows. It’s not like they are so tight they’d defy the laws of gravity. I’ve always loved the comic-character fact sheets that include a two-tone montage behind a full figure of the character. For some reason, they can make the most minor of characters seem important. I think he got roped into it. For some reason or other I thought I could do a better job… So here’s the HM3 upgraded version of Slipknot. ps. If anyone wants to critique it please do so. I actually like that costume, except for the chest cutouts. Worf: Nice! I like it! Imp: Yes, you’re a bad person. NEXT! Worf–great uni redo. And I LOVE how you made the background. 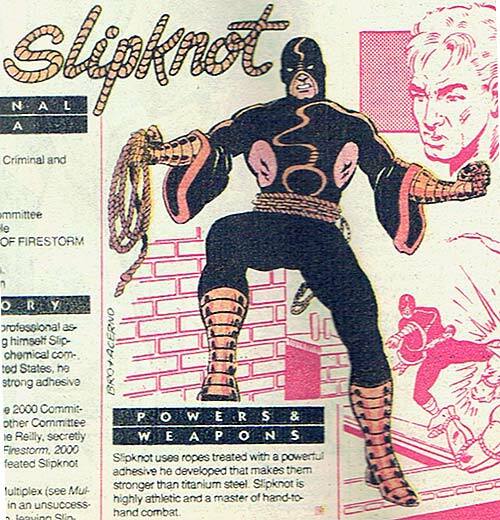 This man is a disgrace to the name of Slipknot. They are an awesome band! @Worf: I’m with Whit. The redesign is much cleaner, and I thought you made a really nice use of the new backgrounds. I am going to guess that his secret weakness is rib-tickling. Of course the only person who could play him in live action movie would have been David Carradine. Oh..that’s right.